Allow me to show you something orange and fun that followed me home from Target last week. Russell + Hazel has a collection of super cute office supplies available under their KIT brand for Target right now. 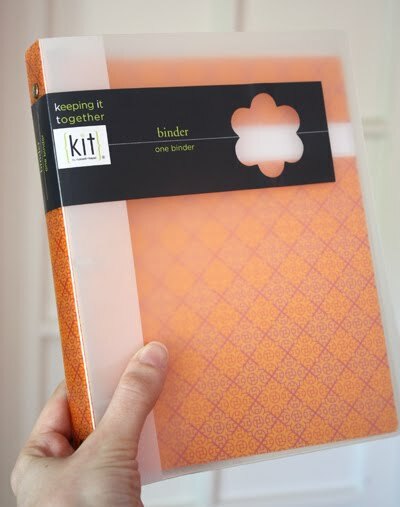 Mix-and-match binders, filler paper, folders, plastic sleeves, sticky notes... how could we resist this little orange binder? P.S. After writing this, I now realize how similar this photo is to the one in the previous post. Please don't worry. I'm not going to take pictures of every single orange thing in my house and show them one by one. Don't tempt me. There's lots more where that came from. Ooo, pretty - that might be just the binder I'm looking for to organize my coupons! Out of curiosity, how big is that binder? I looked on the Target website, but couldn't find the Russell + Hazel line. It's 7" x 9". 3 rings. I think it was $7. Love it. What did you get to go inside? I just noticed that almost everything I'm eating today is orange. Strange? I love Russell + Hazel so excited they are at Target now. Picked one of those a few days back to use for Ali Edwards' *Week In the Life*. The size is nice and I like all of the different inserts you can buy. Just found some Franklin Covey inserts that fit it too (WAY on sale at Office Depot!). BTW...I love the word officey you used in your *tweet*. If it's not in the dictionary, it should be. soo cool! another beautiful thing at target? they never cease to amaze me! "Followed me home"... ya, I bet! Just saw this at Target and immediately thought of you. That and the orange to-do-list pads. I have been waiting for these to hit my Target to finish my Day In The LIfe project.. I had seen a few people using them for that but my Target had not received them last time I checked... I must go back! Oh, that PS made me laugh. I wish we had a Target up here in Canada - their stuff is great! I've chastised coworkers for spending countless dollars on pretty office supplies and now I'm about to do the same thing. How could a pretty file folder possibly hold papers better than a regular manila one? orange is my favorite color.love it. Oh so pretty, so orangey! It's absolutely lovely. I like the color. i swear i didn't like orange before reading your blog... and now i do!!! You poor baby! Being stalked like that........8-) I'm also up for seeing all of your orangeyness at home. I definitely need to make a trip to Target. Thanks for sharing. Thank you, I've been to Target and bought three (in green), they are perfect for storing my HA "cling" stamps. great blog! Love the "orange tour" idea. Love the Russell & Hazel books. Do not love Target and do not patronize them. Would rather buy from a local shop. I love this binder and was looking for info online and couldn't find anything until I found your site. Thanks. I have been trying to find the business card holders (plastic inserts) for the mini binder, can anyone help me?